There is more to the Tories’ proposals on human rights and free movement than mere electioneering, argues Frances Webber of the Institute of Race Relations. The October 2014 Conservative party conference was dominated by justice minister Chris Grayling’s announcement that a future Conservative government will repeal the Human Rights Act, replace it with a British Bill of Rights and Responsibilities, and ignore unwelcome rulings of the European Court of Human Rights at Strasbourg. A fortnight later, David Cameron was said to be urgently considering an ‘emergency brake’ on one of the founding principles of the European Union, the free movement of its citizens, in order to close Britain’s borders to citizens of the EU’s eastern states. Both proposals represent a huge success for the anti-European, anti-foreigner Right, and the corporate press were jubilant at the prospect of putting “Rights Act in dustbin of history” (Sun). But an anonymous, ironic tweet on the proposal to repeal the Human Rights Act read: “Can’t decide which right I hate most — life, liberty, free speech?” So how and why have the Tories managed so successfully to demonise fundamental rights? The aspect of the Human Rights Act which the Right has monstered most violently and persistently is the universality of its protection, using the power and reach of papers like the Mail, the Sun, the Express and the Telegraph to spread lies, distortions and misinformation about rights awarded to ‘undeserving’ groups such as migrants and asylum seekers, terrorists and offenders, by mad ‘Eurojudges’ and their British disciples. With the Orwellian-sounding title, Protecting human rights in the UK, Grayling’s paper, after first reassuring readers that the home of the 800-year-old Magna Carta and the 1688 Bill of Rights is not about to jettison human rights, then tells us that the European Court of Human Rights is guilty of ‘mission creep’, inventing new rights and illegitimately extending the scope of old ones. The existing system distorts the UK’s constitutional balance, he complains, and undermines parliamentary sovereignty. His solution, the British Bill of Rights and Responsibilities, with its reassuring echo of the 1688 Bill, manages to suggest sturdy yeoman British (as opposed to fancy Continental) rights, to be granted not just to anyone but to good citizens, who fulfil their civic duties. According to Grayling’s speech, Travellers will be expected to obey planning laws and keep out of green belt land, even where no provision has been made for lawful sites for them and their families. ‘Foreign criminals’ will be unable to use rights to family life to avoid removal. Rights are not for criminals, particularly foreigners, villains, or other undeserving folk. At a stroke, the notion of universal human rights disappears. And the other thing that will disappear is judicial independence — the careful, case-by-case judicial balancing of personal rights against public interest considerations, a balancing process which lies at the heart of the Convention, but is in danger of being swept away by restrictive blanket rules. The Convention’s only absolute right, which cannot be removed in any circumstances, is the ban on exposing someone to torture or inhuman or degrading treatment. Rights to respect for family and private life have never been absolute, and judges have always weighed them against public interest considerations, which can include protection of health, morals, national security or the country’s economic interests, and prevention of crime or disorder. But the government would prefer foreigners and other unpopular groups not to have rights at all. The Right’s campaign has already led to repeated legislation to limit the family life rights of foreign offenders, and to reforms to the Strasbourg court to allow member states more leeway in their implementation of the Convention rights — particularly in the field of immigration and deportation. But these changes, predictably, have not satisfied the anti-human rights lobby, and the document proposes that while the British Bill would incorporate the text of the Convention rights, they would be subject to a number of ‘clarifications’, which would in practice seriously limit their scope and in some cases completely eviscerate them. It is not just foreigners’ family life rights that are under attack. Under the proposals, someone fearing torture as a result of deportation would have to prove more than just a ‘real risk’ of torture, as at present (the current test reflects the difficulty of proving in advance that a fear is well-founded). Another ‘clarification’ would narrow the definition of ‘inhuman or degrading treatment or punishment’ to enable foreigners to be deported to war zones. And the Bill would restrict human rights protection to those physically in the UK, denying it to those shot, tortured, abducted or illegally detained by British soldiers or officials overseas, or relatives of those killed by drones operated from the UK, who would have no remedy in the British courts. The proposals would limit the use of human rights law to the most serious cases such as criminal law and liberty, and property (the paper curiously omits freedom from torture or the right to life). Parliament would define a threshold below which UK courts would provide no remedy for violations of human rights. If the UK remained signed up to the European Convention, those denied a remedy here could go to the European Court in Strasbourg — and human rights lawyers have pointed out that the British Bill would result in many more cases at Strasbourg. The document has the answer to that too — rulings of the European Court would no longer be binding on the government, but purely advisory. If, as appears to be the case, this radical redefinition of the Court’s role is not acceptable to the Council of Europe (the creator of the Human Rights Convention and its court), the Tory proposal is simple: we leave the Council of Europe (membership of which requires compliance with the Convention) and the European Union (which is in the process of signing up to the ECHR – a process which, as the document points out menacingly, requires unanimity among member states). Legal commentators have remarked on the ‘legal illiteracy’ of the human rights proposals – the fact that, for example, treating the Strasbourg Court as an advisory body and refusing to be bound by the Convention is not permitted by the Convention itself and so cannot be accepted by the Council of Europe. Former attorney-general Dominic Grieve condemned the plans as “almost puerile and unworkable”, adding that they would damage the UK’s reputation, and former justice secretary Kenneth Clarke concurred. (Both men were removed from ministerial posts to ensure the proposals got through Cabinet.) Political commentators have seen the move exclusively in terms of addressing the twin threats to the Tory leadership from UKIP and from their own members. There is more to it, though, than electioneering. While it is clearly a useful way of retaining the votes of UKIP-leaning right-wingers, it is first and foremost calculated to free government ministers, together with their corporate allies, from the excessive demands of the rule of law. It is part of the project to dismantle the post-war settlement which gave ordinary people not only protection from want, from sickness, homelessness and destitution, but also unprecedented legal protection for basic rights. The same impetus behind cutting to the bone the welfare state, the educational infrastructure of libraries and youth provision, social housing, which led to the privatisation of water and the post, probation and prisons, underlies this assault. Removing workers’ protections, slashing environmental, health and safety inspectorates, diluting equalities duties, cutting legal aid, making it more difficult and expensive to enforce rights against employers, landlords and government officials – these are all of a piece with the attack on human rights. The European Convention on Human Rights does not guarantee rights to work, livelihood, decent working conditions, social security or health care, or to housing, These economic and social rights, although proclaimed as human rights in the 1948 Universal Declaration, the founding post-war human rights document, were believed too ‘socialist’ for its drafters. But the Convention, and the Strasbourg court which stands at the apex of human rights protection in Europe, have nevertheless been a success. The Court’s enormous backlog of cases testifies to its usefulness as a court of last resort against member states’ human rights violations, and as a standard-setter for human rights protection across Europe. This success has been achieved through the right of individual petition, whereby anyone, whatever their nationality, affected by a decision of a signatory state, can petition the Court directly if they cannot get a remedy from the domestic courts. The Court has been criticised for excessive deference to the liberal governments of western Europe, particularly over issues such as national security. But its judgments taken as a whole have created a protective infrastructure for citizens and denizens of Europe, and British judges have been inspired and informed by the European human rights framework to develop British human rights law in the UK. The right to life enshrined in Article 2 of the Convention includes protection from known and imminent threats to life, so that police forces which fail to protect victims from fatal attacks by known perpetrators (whether violent partners or racist neighbours) must be held accountable. It also imposes duties of effective investigation on States, particularly of deaths at the hands of State agents – of vital importance for families of those who have died in police or prison custody. Article 3, the prohibition of torture and inhuman or degrading treatment or punishment, has been used not only to ban interrogation techniques such as wall-standing, stress positions, white noise, sleep deprivation, deprivation of food and water used by British soldiers in northern Ireland, but also against evils as varied as prison overcrowding, corporal punishment in schools and the enforced destitution of asylum seekers. Free speech rights mean that criticism of public bodies must be protected. Derogations from liberty must be justified. 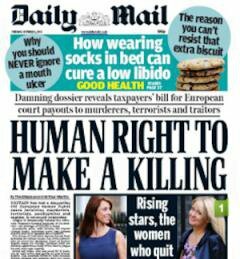 Daily Mail's bogus human rights splash 7 October 2013Equality is a cornerstone of the Convention. Equality of arms as between parties to legal proceedings, a key ingredient of fair trial rights, has been deployed to restrict the growth of secret evidence and to ensure that legal aid is not totally abolished. The residence test for legal aid was ruled unlawful in cases where all, resident or not, are equally subject to the law and equally entitled to its protection. Non-discrimination in the enjoyment of rights removed the stigmata of birth outside marriage and allowed LGBT rights to flourish, as well as preventing children being removed into care simply because their parents are undocumented. And the much-maligned Article 8 — the right to respect for the home, family and private life, privacy and correspondence — not only prevents unjustified separation from family members through deportation; it also protects citizens from abusive or blanket surveillance, from excessive air and noise pollution or other environmental harm interfering with physical or mental health, from disclosure of private information and from random searches and raids. The Human Rights Act brought human rights home, in the sense that it gave British judges the power to act on human rights abuses instead of requiring complainants to take their case to the human rights court at Strasbourg. The Act has forced State bodies to become more transparent and more accountable. These human rights standards require government not only to control its own agents, whether police or prison officers, but also to provide a legal and regulatory system which prevents and deters violations by private actors such as companies whose activities interfere with human rights. But, as we saw with the government’s relaxed response to zero hours contracts and food banks, and the fate of its promises to curtail corporate lobbying (which morphed into an Act regulating charitable campaigning and trades unions), regulation of corporations and their activities goes against the government’s grain. Instead, the coalition’s policies over the past four years, from benefit caps and sanctions, work assessments for the terminally ill, to clampdowns on ‘benefit tourism’, culminating in the frontal assault on free movement of EU citizens, have been designed to regulate people in the interests of the corporations, rather than vice versa. Corporations are increasingly the perpetrators of human rights abuses. As free marketeers, they want to cut ‘red tape’ (while of course taking advantage of export credit guarantees, EU agricultural and developmental subsidies and anything else that’s going). And the government fully supports corporate rights - to build, to mine, to excavate, to pollute through fracking, open cast mines, oil wells and refineries, industrial livestock farming, to have all the railways and airports they need regardless of noise, air pollution, water poisoning and disruption to ordinary life. A government which governs so blatantly in the interests of the corporations and so careless of the resulting damage to the poorest and most vulnerable is bound to face resistance, and to become more authoritarian and less democratic as a result. In the recent past the UK has faced adverse judgments from the Strasbourg Court for the retention of DNA samples of innocent people, and for the blanket use of stop and search under counter-terrorism legislation. Is it a coincidence that the DRIP Act, rushed through parliament in three days in July 2014, reinstates the potential for blanket electronic surveillance of the entire population which the Court of Justice of the European Union (informed by ECHR privacy concerns) had just declared unlawfully broad? Or that contemporaneously with the announcement of human rights reforms, we were told that Theresa May plans further to criminalise non-violent ‘extremism’? (Remember that those targeted for intensive police surveillance as ‘domestic extremists’ have included the families of Stephen Lawrence and Ricky Reel, and other campaigners against racism and for police accountability, as well as socialist historians of the stature of Christopher Hill and Eric Hobsbawm.) We are being asked to trust this government with deciding which of our rights are ‘trivial’ and not worth protecting, and which European Court judgments it should obey. 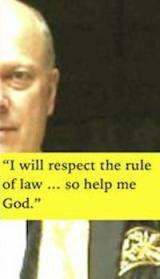 Grayling, Lord ChancellorGrayling, the main architect of the human rights proposals, has made no secret of his disdain for the law, lawyers and judges. He has presided over the most savage legal aid cuts ever, leaving legal advice deserts across the country as judges struggle to cope with the flood of litigants in person. Hikes in court fees have meanwhile made justice an expensive commodity even without lawyers. His SARAH (Social Action, Responsibility and Heroism) Bill is an attempt to coerce judges into granting ‘socially responsible’ companies immunity from negligence actions. At the same time, he has flouted an Appeal Court ruling which forbids using physical force to discipline young offenders, and dismissed as insignificant a runaway rise in prison suicides and authoritative warnings of staff cuts, severe overcrowding, rising tensions and ‘rapidly deteriorating safety’ in British jails. The government is fed up to the back teeth with judicial activism, with being told it can’t push through every element of its slash-and-burn programme of welfare reform, or all of its legal aid cuts, that the State does owe some residual duties to those outside the charmed circle: to prisoners, to ‘feckless’ families and their children, to the destitute, to the migrants whose labour supports British pensioners. It wants the freedom to carry on its industrial-scale surveillance of phone calls, emails and other internet traffic without judicial interference. It wants its soldiers abroad not to have to worry about the human rights of prisoners. It does not want judges in the domestic courts repeatedly finding that the prolonged detention of suicidal foreign prisoners is inhuman and degrading, or condemning secret evidence by anonymous witnesses. It wants to let refused asylum seekers starve if they won’t go home. It wants to make it impossible for the unmoneyed and unskilled to come to or stay in the UK — whether they come from Africa, Asia or the EU. The ‘emergency brake’ proposed by Cameron on the freedom of movement of citizens of the poorer EU states is as impossible a demand for the EU as are the human rights ‘reforms’ to the Council of Europe. As both the incoming and outgoing European Commission presidents, Barroso and Juncker, and German Chancellor Angela Merkel commented, the principle of free movement is fundamental to the EU. Cameron’s suggestion of restrictions on member states’ nationals was condemned as irresponsible. Exit from the EU is far more problematic for the Conservatives’ corporate backers than is the retreat from human rights: as James Meek pointed out, the EU is a hybrid project, serving the interests of social justice and global capitalism simultaneously. But what both the Tories’ proposals on human rights and free movement have in common is a retreat from international cooperation for the protection of people’s rights, towards a more unfettered capitalism combined with a little-Englander social isolation. This is an abridged version of Frances Webber's article for the Institute of Race Relations. See IRR News for the complete and fully-referenced article.